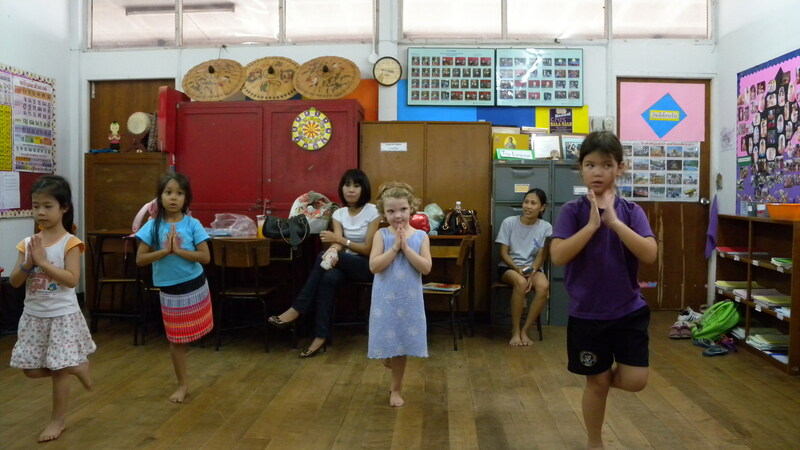 On the suggestion of the Chiang Mai International School Newsletter, I brought Camilla to the first meeting of the after-school Thai Dance Club. She was the youngest girl there by three grades, and the only farang. Nevertheless, Khru La, the very proper Thai language and culture teacher, welcomed her warmly and fully expects her to participate in the November dance performance the girls have been preparing for since last spring. (Khru is the honorific for teacher; ajaan is the honorific for professor.) 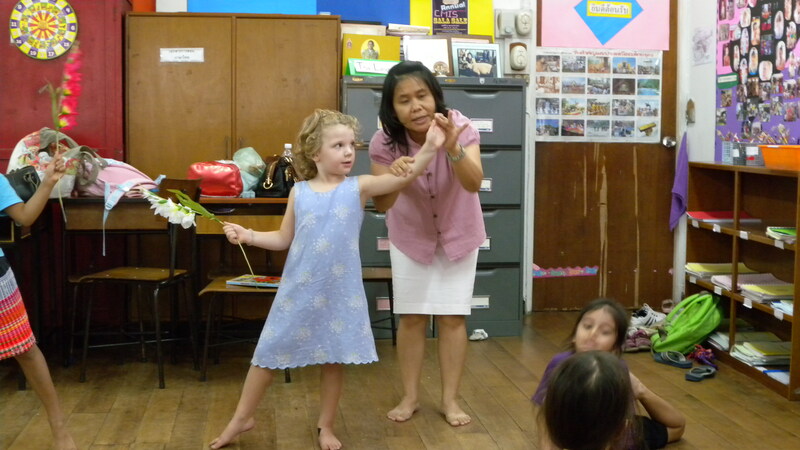 Camilla’s delight in her Thai dance lessons can be best described as persistent. She enjoys being in with the “big girls” (this club is fourth grade and younger) and likes to work hard at the choreography Khru La has designed for them. She needs to work hard at it: the coordination it requires is a challenge for a child her age. 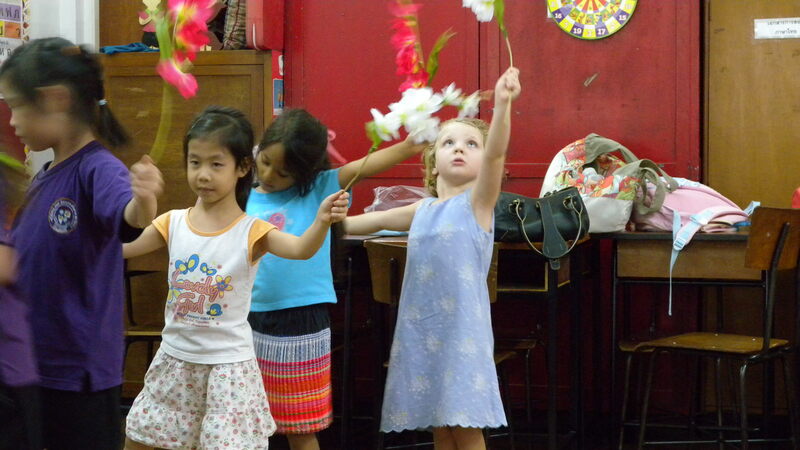 But she gets to wave a silk flower, spin around like a Thai princess, and be lauded for her sweet smile and easy wai. Anthropologists sometimes divide the world into “shame cultures” and “guilt cultures.” The United States is a “guilt culture”: we do not sin because we know we should not, and we internalize the aversion to sin because we don’t want to feel guilt. We could sin, and nobody would know it but ourselves, and that is bad enough. Thailand, like most Asian cultures, is a “shame culture.” You develop an aversion to sin because your family, or your village, or your clan will shun you for it, or suffer by association with you. The mechanics that deter you from doing wrong are external. The relevance here is that at least once every Tuesday afternoon, Camilla is used as an instrument of shame against her fellow club members. Most of the other five girls are a handful, to put it nicely: not listening to Khru La, racing off in the middle of the demonstration of a dance step to stuff snacks down their throats, throwing themselves on the floor and pouting when they want to take a break (during a forty-five minute lesson). Camilla, may I say so myself, is brought up better than that, and also doesn’t have social comfort with the big girls or good enough Thai to join in their mischief. So we find Khru La regularly haranguing the other girls in her fantastic mix of Thai and English: “You see Tookita? She doesn’t want to eat snack during dance class. She practices her steps. She doesn’t fall on the floor. Isn’t that so? She is in pre-school. You are in the third grade. Is Tookita Thai? No. She is farang. Isn’t that so? Are you Thai? Or are you farang?” Camilla is blissfully unaware of anything but Khru La’s smile—and being Thai, Khru La is of course smiling as she delivers this scathing rebuke—but I’m not thrilled about farang-ness being associated with shame. Is it so remarkable that a farang child could be respectful? Apparently. The love of Jesus Christ our Lord. Or will he go down to Hell? Camilla can now deliver the Thai word for “hell” with great enthusiasm. More of my experiences among the missionaries will be reserved for a later installment. I guess you can take solace in the fact that Camilla is so young and your stay so short. There isn’t time for these messages to take root. And it also provides you with the opportunity to establish a foundation of belief (non-belief) in your home. It’s not surprising that Southern Jews, who are a significant minority cling more tightly to Jewish cultural traditions and institutions (the exception being bacon and barbecue).